Abbie Abert, left, plays the witch in the production of “Into the Woods” during rehearsal Wednesday at St. Columba School. Director Mariah May-Ostendorp talks with her actors during dress rehearsal for “Into the Woods.” The musical will be performed tonight and Saturday. 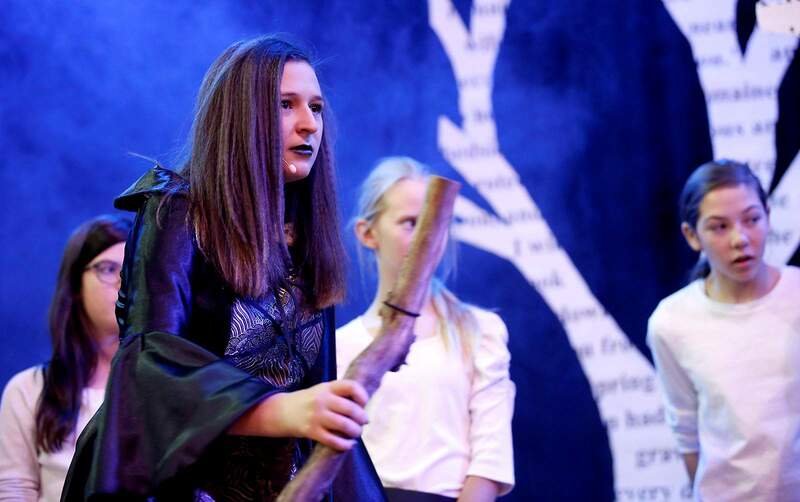 “Into the Woods” will be performed this weekend at St. Columba School. Dress rehearsal for Into the Woods on Wednesday at St. Columba School. 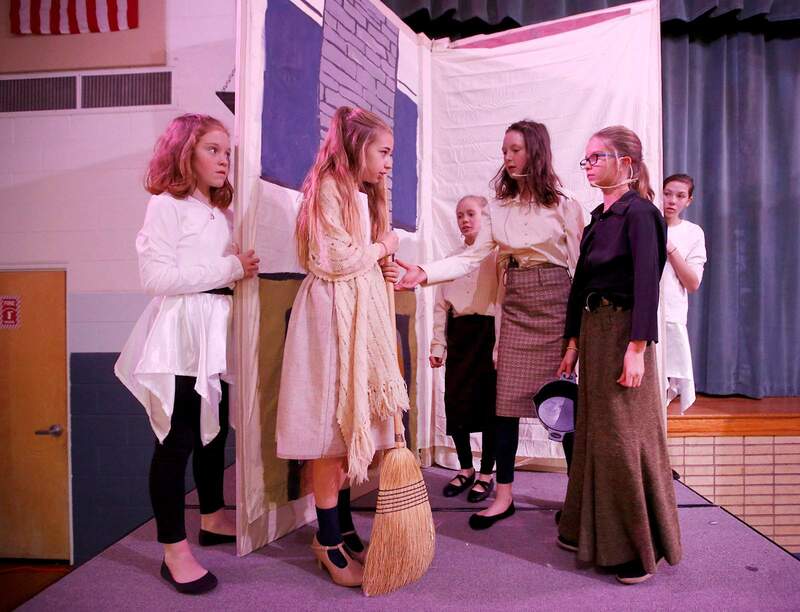 Ellie Clark, center, plays Cinderella in the production of “Into the Woods” at St. Columba School. Madelayne Green plays Jack in Jack and the Beanstalk in the production of “Into the Woods” during rehearsal Wednesday at St. Columba School. 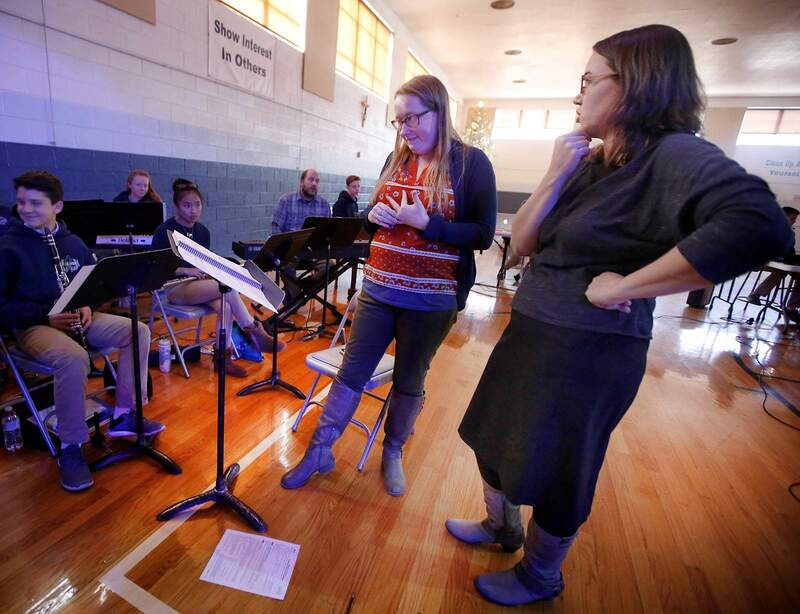 Alisa Stuard, left, co-music director, talks director Mariah May-Ostendorp during dress rehearsal for “Into the Woods” at St. Columba School. Alisa Stuard, co-music director, leads the band during dress rehearsal for “Into the Woods” on Wednesday. This weekend, middler-schoolers in St. Columba School’s Arts Elective Program will be taking on some pretty challenging roles – on stage, behind the scenes and in the orchestra pit. 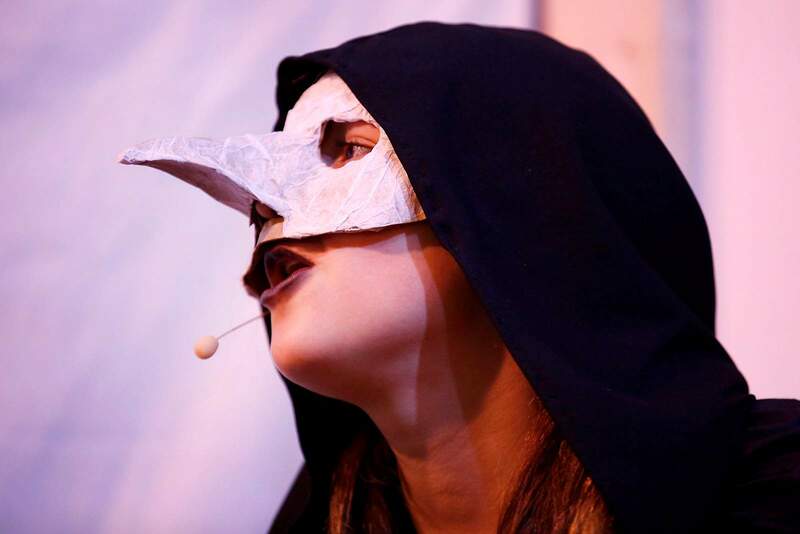 The students will be staging their production of “Into the Woods,” the Stephen Sondheim musical that takes several favorite fairy tales and explores what consequences befell the heroes of each as a result of the choices they made. 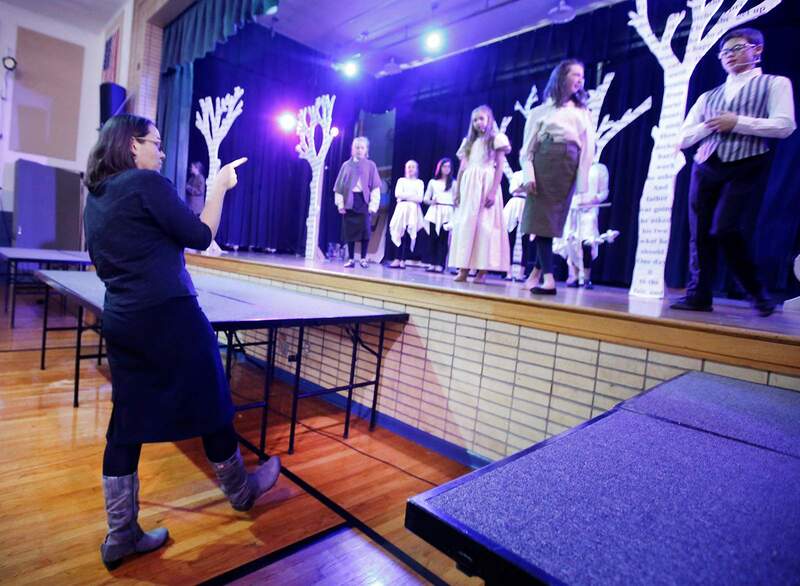 Mariah May-Ostendorp, language arts and theater teacher and director of the production, said it’s that emphasis on the consequences that helped the teachers decide to take on the challenge of staging the full “Into the Woods” instead of a junior version. So the kids will be staging the full production – which includes an orchestra pit made up of kids in band – which comes in at about two and a half hours. 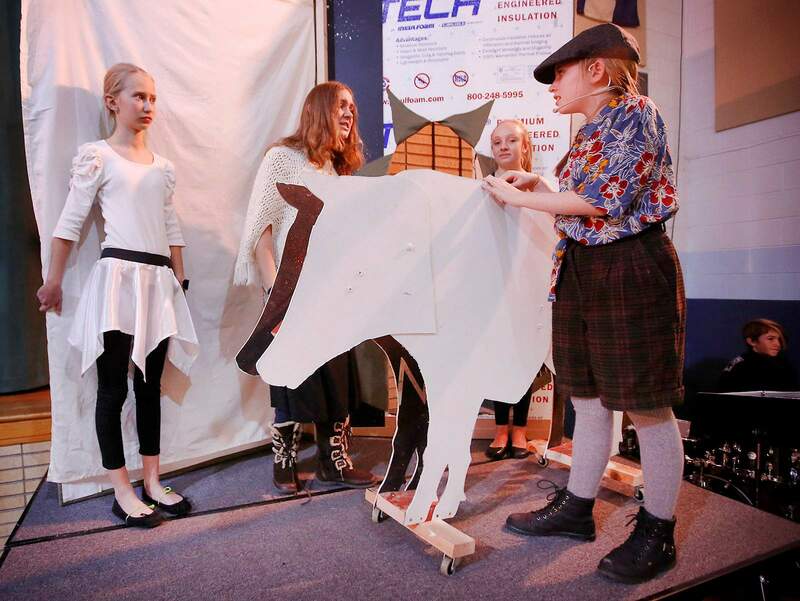 Students in the production are part of St. Columba School’s arts elective program, which was introduced a couple of years ago, May-Ostendorp said. Students are able to choose two out of four classes: theater design, theater acting, instrumental music – band, (which is the pit orchestra for “Into the Woods”) and art. It’s been collaboration between the four classes that has resulted in the success of “Into the Woods,” she said. While the musical would be a challenge for even those in high school, May-Ostendorp said that not only were the students up for it, coming off the success of last year’s production of “The Wizard of Oz,” they were ready. “We had originally said we weren’t going to do a musical every year, but then the musical directors and I started thinking about our eighth-grade class and they are just stacked with strong vocalists. So we thought, ‘We’ve got to do a musical this year,’” she said. Staff also took into consideration the idea that all students get a chance in the spotlight – not just one, May-Ostendorp said. “One of the reasons we really liked it is because it’s not a one-lead show. It’s tricky, but we’ve been trying to find scripts that allow a lot of students the opportunity, especially since we have so many strong actors, singers. Where: St. Columba School, 1801 East Third Ave.